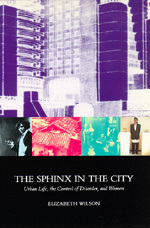 Elizabeth Wilson's elegant, provocative, and scholarly study uses fiction, essays, film, and art, as well as history and sociology, to look at some of the world's greatest cities—London, Paris, Moscow, New York, Chicago, Lusaka, and São Paulo—and presents a powerful critique of utopian planning, anti-urbanism, postmodernism, and traditional architecture. For women the city offers freedom, including sexual freedom, but also new dangers. Planners and reformers have repeatedly attempted to regulate women—and the working class and ethnic minorities—by means of grandiose, utopian plans, nearly destroying the richness of urban culture. City centers have become uninhabited business districts, the countryside suburbanized. There is danger without pleasure, consumerism without choice, safety without stimulation. What is needed is a new understanding of city life and Wilson gives us an intriguing introduction to what this might be. Elizabeth Wilson is Professor of Social Studies at the Polytechnic of North London, and the author of a number of books, including Adorned in Dreams (California, 1988) and Hallucinations (Constable, 1989).